Learning Center> Blog > Uncategorized > 3-D Vision Funded in Just Days! 3-D is making a comeback! Gene Dolgoff, inventor of the LCD digital projector, has created a brand new device to shake up the tech scene yet again. His latest invention, 3-D Vision’s Instant 3-D Converter, hooks up to any media platform via composite, VGA, or HDMI cables to instantly turn all 2-D content into 3-D content. The 3-D Converter managed to breeze past its goal and gain a plethora of media coverage in a matter of days. Near the very beginning of his Fundable campaign, Gene met Gerald Williams (or HipHop) of the HipHopGamer Show. The pair immediately hit it off when Gene amazed HipHop with demonstrations of the Instant 3-D Converter in action; in fact, HipHop was so in awe of the device that he asked Gene to meet up again for a video interview (and more 3-D gaming sessions). HipHop’s affinity for Gene’s new device is apparent through numerous tweets, a 45-minute Youtube interview/demonstration video, and the repeated help in increasing Gene’s visibility to the public at large. In fact, HipHop even reviewed a currently unreleased game from Microsoft, Darksiders 2, using the Instant 3-D Converter on his website. 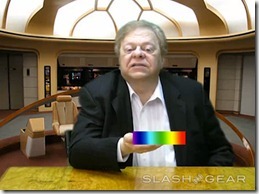 Soon after HipHop’s review of the Instant 3-D Converter, Gene conducted an online interview with the public at large using Reddit.com’s AMA model. Over a span of two days and many hours, Gene was asked dozens of thought provoking questions by Reddit users. The public interview is still available for anyone to read and provides great insight into not only the Instant 3-D Converter, but into Gene as a person and businessman. Between the massive success of Gene’s AMA and HipHop’s clear passion for Gene’s device, media mentions and requests for demonstrations soon began to roll in. More than twenty-three media outlets have covered the Instant 3-D Converter at the time of this writing: Slashgear, The Jace Hall Show, PandoDaily, Digital Trends, and SoCalTech, to name just a few. With approximately three weeks left in his campaign, Gene hopes to go even farther above and beyond his Fundable goal and has continued to schedule media interviews and live public demonstrations of the 3-D Converter. Notably, Gene will give a demonstration of the converter at the esteemed New York Games Conference on September 5. If you’d like to pre-order your own Instant 3-D Converter, you can do so on Gene’s profile – and great news! If you pre-order this device through Gene’s Fundable profile, you’ll save $150. Get your 3-D on! Digital Trends – Make Any TV 3D? This converter will do it! Killer Startups – Gene Dolgoff is taking 3D Imagery to a Whole New Level. Again. 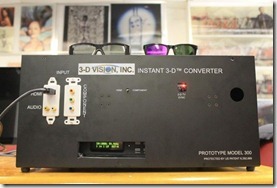 Talk Nerdy to Me – Instant 3-D Converter – Want. OhhWord – Watch Everything in 3-D?